What is Israël’s project in Argentina? 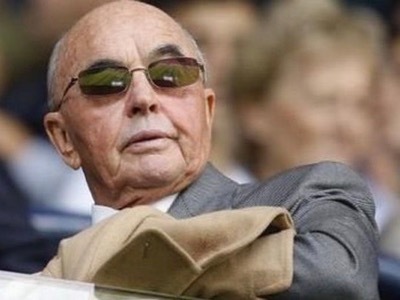 Owner of 175 companies, including restaurant chains and Tottenham Hotspur football club – whose fans call themselves the « Yid Army » – the very discreet billionaire Joe Lewis speculates on the exchange market in partnership with his friend George Soros. The Argentinian authorities are wondering about the massive purchase of land in Patagonia by a British billionaire, and the « holidays » that tens of thousands of Israëli soldiers are enjoying on his property. In the 19th century, the British government were undecided as to where they should settle Israël – either in what is now Uganda, in Argentina or in Palestine. In fact, Argentina was at that time controlled by the United Kingdom and, on the initiative of French baron Maurice de Hirsch, had become a land of refuge for Jews who were fleeing the pogroms in central Europe.In the 20th century, after the military coup d’Etat against democratically elected President General Juan Perón, a current of antisemitism developed within the armed forces. A brochure was distributed accusing the new State of Israël of preparing an invasion of Patagonia, the « Andinia Plan ».It has become apparent today that even though the Argentinian extreme right had exaggerated the facts in the 1970’s, there was indeed a project for implantation (and not invasion) in Patagonia. Everything changed with the Falklands War in 1982. At that time, the Argentinian military junta attempted to recuperate the Falkland Islands, South Georgia and the South Sandwich Islands, which from their point of view had been occupied by the British for a century and a half. The UNO recognised the legitimacy of the Argentinian claim, but the Security Council condemned the use of force to recover these territories. The stakes are considerable, since the territorial waters of these archipelagos offer access to all the riches of the Antarctic continent.At the end of this war, which cost more than a thousand lives (official British figures are largely understated), London imposed a particularly severe Peace Treaty on Buenos Aires – Argentinian armed forces are limited to their most simple expression. Above all, the control of their Southern and Antarctic air space is confiscated for the profit of the Royal Air Force, and they are obliged to inform the United Kingdom about all their operations.In 1992 and 1994, two particularly devastating, murderous and mysterious attacks successively destroyed the Israëli embassy and the headquarters of the Israëli association AMIA. The first attack took place when the station chiefs of Israëli Intelligence had just left the building. The second occurred in the context of joint Egypt-Argentinian research for the development of Condor ballistic missiles. In the same period, the main Condor factory exploded, and the sons of Presidents Carlos Menem and Hafez el-Assad died accidentally. The various enquiries gave rise to a succession of manipulations.After having blamed Syria, prosecutor Alberto Nisman turned on Iran, whom he accused of having ordered the two attacks, and Hezbollah, who he claimed had carried them out. The ex- Peronist President Cristina Kirchner was accused of having negotiated the end of the legal proceedings against Iran in exchange for advantageous oil prices. Prosecutor Nisman was found dead at his home, and President Kirchner was found guilty of high treason. However, last week, a coup de theâtre destroyed everything we though we knew – the United States FBI handed over DNA analyses which attest to the absence of the presumed terrorist among the victims, and the presence of a body which has never been identified. 25 years later, we know nothing more about these attacks.In the 21st century, benefitting from the advantages offered them by the Falklands War Treaty, the United Kingdom and Israël are now setting up a new project Patagonia.British billionaire Joe Lewis has acquired immense territories in the South of Argentina and even neighbouring Chile. His properties cover areas several times larger than the State of Israël. They are situated in Tierra del Fuego, at the extreme Southern point of the continent. In particular, they surround the Lago Escondido, which effectively denies access to the entire region, despite a legal injunction.The billionaire has built a private airport with a two kilometre landing strip, in order to be able to receive civil and military aircraft. Since the Falklands War, the Israëli army has been organising « holiday camps » (sic) in Patagonia for its soldiers. Between 8,000 and 10,000 of them now come every year to spend two weeks on Joe Lewis’ land.While in the 1970’s, the Argentinian army noted the construction of 25,000 empty houses, which gave rise to the myth of the Andinia Plan, hundreds of thousands have been built today.It is impossible to verify the state of the construction work, since these are private lands, and Google Earth has neutralised the satellite photographs of the area, just as it does with NATO’s military installations.Neighbouring Chile has handed over a submarine base to Israël. Tunnels have been dug in order to survive the polar winter.The Mapuche Indians who inhabit both Argentinian and Chilean Patagonia were surprised to learn that the Resistencia Ancestral Mapuche (RAM) had been reactivated in London. This is a mysterious organisation which fights for independence. First accused of being an old association recuperated by the Argentinian secret services, the RAM is today considered by the left as a legitimate secessionist movement, but by the Mapuche leaders as an initiative financed by George Soros.On 15 November 2017, the Navy lost all contact with the submarine ARA San Juan, which was finally declared lost at sea. It was one of the TR 1700 class diesel-electric submarines which were the flagships of the reduced Argentinian army. The Preparatory Commission for the Comprehensive Nuclear-Test-Ban Treaty Organisation (CTBTO) has announced that it has recorded an unusual acoustic phenomenon in the Atlantic, close to the area from which the San Juan sent its last signal. The government finally admitted that the submarine was on a non-specified « secret mission », of which London had been informed. The USA began a search, while the Russian Navy deployed a drone capable of exploring the ocean to a depth of 6,000 metres, but found nothing. The San Juanprobably exploded. The Argentinian Press is convinced that the submarine had either collided with a mine, or was destroyed by an enemy torpedo.It is impossible for the moment to determine if Israël is engaged in a programme for the exploitation of Antarctica, or if it is building a rear base in case of defeat in Palestine. Has Israel Effectively Colonized the United States? The Falklands War 1982 … I read that British P.M. Margret Thatcher … Madam Iron Pants .. was so adamant about winning that she was prepared to use nuclear weapon, if that’s what it took. The destination of Israel was alway the Holy Lands .. no matter what may have been pretended. The Holy Lands have DIVINE & Magical Properties that are imperative to attain success in all things. It is also where the Sacred Blood of Jesus Christ was shed .. The overpowering of Jesus Christ was said to be an overpowering .. reigning in .. man attaining control over the powers of God .. making God & his divine powers & indeed, the supernatural beings both good & evil, obedient to the will of .. certain knowledgeable & anointed .. men on earth. One example of the belief that mere men could summon & control supernatural powers is The Key Of Solomon & there are many more. In doing so you are embraced by the entity’s of other users & they may not be productive to your aims & good health. You cultivate your own relationship with the supernatural world & it’s powers. You create your own dialogue. To run contraband no doubt … they have to get it in some how. Looking at headlines – Argentina is the crime nation of planet Earth. Everyone & their dog & cat & their flea’s are at it. The NSW cops who are bored should relocate to Argentina. Billionaire Joe Lewis is just another stooge for the establishment BOSSES. Just another fall guy like the late George Soros. Organ grinders monkeys – is ll.